How and Where to Buy Onglyza Online? You can buy Onglyza through CanadianPharmacyWorld.com at a very reasonable price. We do require a valid prescription from your doctor. Our International Pharmacy offers brand and generic RX and OTC medications online. Canadian Pharmacy World is a certified member of The Canadian International Pharmacy Association (CIPA). Are There Alternative Names for the Brand and Generic Onglyza? The brand Onglyza comes from India and Turkey manufactured by Bristol-Myers Squibb. There is no generic available for this medication. Our Canada Pharmacy also carries other Diabetic Medications and Products. What Dosages and Forms is Onglyza available in? Onglyza is available in the strength of 2.5mg and 5mg tablets. What is Onglyza used for? 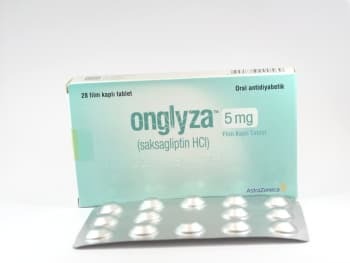 Onglyza (Saxagliptin) is a prescription medication that is used to control high blood sugar in people with type 2 diabetes when it is combined with a proper diet and exercise program. Saxagliptin works by increasing levels of natural substances called incretins that help to control blood sugar by increasing the release of insulin especially after a meal. Controlling high blood sugar in patients with type 2 diabetes can help prevent kidney damage, blindness, nerve problems, loss of limbs and sexual function problems. It may also lessen your risk of a heart attack and stroke. What are the Possible Side Effects of Onglyza? Are there any Precautions or Drug Interactions for Onglyza? You should not use Onglyza if you are allergic to Saxagliptin or if you have any other allergies. Before you start using this medication, talk to your doctor about your medical conditions and about all the medications you take including OTC and herbal medications. You should not drive, use machinery or do any activity that requires you to be alert or have a clear vision because you may experience blurred vision, dizziness or drowsiness due to extremely low or high blood sugar levels. Limit your alcohol intake while taking this medication because it may increase the risk of developing low blood sugar and pancreatitis. This medication should not be used during pregnancy unless it is clearly needed. It is not known if this medication passes into breast milk. Talk to your doctor before breast-feeding a baby. Onglyza should be stored at room temperature away from light and moisture out of reach of children and pets. This medication should not be stored in the bathroom.